Savers who invest their pensions must be told annual fees in pounds and pence upfront and once a year throughout retirement, the City watchdog has proposed. 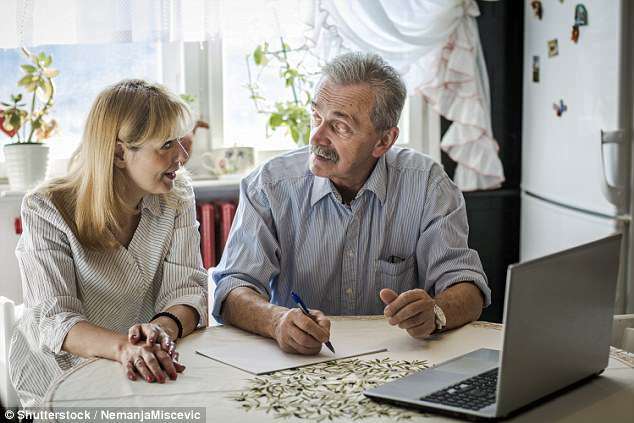 It says charges for drawing down an income from your pension fund vary considerably – with from 0.4 per cent to 1.6 per cent a year taken from your pot by providers – and ‘can often be complex, opaque and hard to compare’. A cap on drawdown fees has not been ruled out, if firms don’t set ‘appropriate’ charges themselves, according to the Financial Conduct Authority. Other proposals to help savers include changes to ‘wake-up packs’ that pension firms send to people approaching retirement. It says these should be introduced from age 50, include a single page summary of their savings – known as a ‘pensions passport’ – and be resent to savers every five years. The watchdog, which looked at how well pension freedoms are working for savers, admitted that while consumers have welcomed the changes, some are at risk of harm. The reforms, which gave over-55s greater control over their pension savings, have led to some sticking their money in cash accounts where they get eaten up by inflation, and others taking risks in the stock market without getting financial advice. Key changes from April 2015 included removing the need to buy an annuity to provide income until you die, giving access to invest-and-drawdown schemes previously restricted to wealthier savers, and the axing of a 55 per cent ‘death tax’ on pension pots left invested. The changes apply to people with ‘defined contribution’ or ‘money purchase’ pension schemes, which take contributions from both employer and employee and invest them to provide a pot of money at retirement. They don’t apply to those with more generous gold-plated final salary or ‘defined benefit’ pensions which provide a guaranteed income after retirement. ‘The FCA found that 60 per cent of consumers not taking advice about drawdown were not sure or only had a broad idea of where their money was invested,’ said the watchdog. The FCA estimates some drawdown customers could receive 37 per cent more retirement income from their pot every year by investing in a mix of financial assets – such products typically hold stocks, bonds and property – rather than cash. 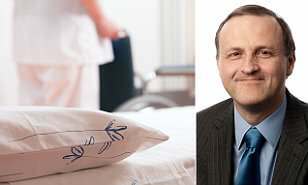 The watchdog also reckons people should be given a ‘more structured set of options’ at retirement, although it sidestepped a call by MPs for a simple ‘default’ drawdown option with charges capped at 0.75 per cent. The Government rejected the idea last week, and said it would wait for and consider the FCA’s findings on drawdown charges. The FCA today said it would consult on three ready-made drawdown ‘investment pathways’ for consumers with fairly straightforward needs. * I want to keep my money invested for a long period of time and may want to dip into it occasionally. The watchdog is also looking at how to help the people it reckons are dipping into pots to take a 25 per cent tax-free lump sum after turning 55 despite not intending to retire yet, then making poor investment moves with the rest of the money. They enter drawdown to get their lump sum, without engaging in what happens to the balance of their pension fund – which sometimes ends up in a cash fund that won’t give them any investment growth. The FCA is therefore asking the Government to consider ‘decoupling’ taking tax-free cash from other pension decisions, so people can put off deciding what to do with the rest of their pot. However, there are tax implications as at present after you begin withdrawals, you can only put £4,000 a year into your pension and still get tax relief. To help the savers who end up putting their pensions in cash within a drawdown plan, the watchdog proposes making this into a more ‘active’ choice. ‘We expect firms to have a strategy for dealing with consumers who have already been defaulted into cash, and who are unlikely to be best served by this strategy,’ it said. Christopher Woolard, executive director of strategy and competition at the FCA, said: ‘We know that the choices introduced by the pension freedoms have been popular with many consumers. What did the FCA find on drawdown charges? * Fees vary considerably, from 0.4 per cent to 1.6 per cent a year. * Switching from the highest to the lowest cost provider could increase your annual income by 13 per cent. * Drawdown charges are on average higher than for saving into a pension, where they are capped at 0.75% on ‘default’ funds used by most workers. * Some drawdown products have as many as 44 charges linked to them, making it hard to compare and shop around. * ‘Firms should challenge themselves on the level of charges and use 0.75% on default arrangements in accumulation as a point of reference,’ says the FCA. ‘However, they’re now required to make more complicated decisions than ever before. Many people need more support when making choices. What does the pensions industry say? Huw Evans, director general of industry body the Association of British Insurers, said: ‘Introducing a set of investment pathways for customers going into drawdown is a common sense approach which should strike the right balance between engaging them in decision-making while taking away some of the complexity. Nigel Peaple, director of policy and research at the Pensions and Lifetime Savings Association, said: ‘The pension freedoms have resulted in savers needing to make extremely complex decisions at retirement, and we know people are often making these on their own. NEST, the state-run auto enrolment pension provider, wants to offer its own drawdown product but so far has been barred from doing so despite support for the idea from MPs on the influential Work and Pensions Committee. Gavin Perera-Betts, chief customer officer at NEST, said: ‘We welcome the FCA’s recommendation that pension schemes should be offering their members access to guided pathways. ‘We want our members to have choice at retirement so they can pick the outcome which suits them best. Guided pathways would allow savers to move seamlessly into a retirement income which is professionally managed on their behalf, and avoid the consumer harm highlighted by the FCA. Ian Browne, pensions expert at Old Mutual Wealth, said: ‘A study from Which? Money shows that drawdown charges differ drastically, in part because of different structures. A cap on charges could have hindered innovation or even quality. ‘It makes more sense to define what effective investment pathways look like for people and then consider how to make them as cost-effective as possible. Jenni Allen, managing director of Which? Money, said: ‘The proposal to introduce investment pathways will go a long way to support disengaged savers and help them make smart retirement income choices. ‘However, it is disappointing that the FCA has stopped short of calling for a charge cap on pension drawdown products, that could stop consumers from sleepwalking into costly and confusing products that can drain the money they need for their retirement. How did FCA assess the harm from staying in cash rather than investing in retirement? The FCA estimates some drawdown customers could receive 37 per cent more retirement income from their pot every year by investing in a mix of financial assets rather than cash. It used an adjusted version of the expected rates of return the FCA uses when making financial projections.Full details are here. It assumed an asset mix of 50 per cent equities, 20 per cent government bonds, 20 per cent corporate bonds, 7 per cent property and 3 per cent cash. ‘We considered someone who would drawdown their pension pot over 20 years after accessing drawdown. This equates roughly to someone at 65 drawing down until life expectancy but could also reflect a number of other scenarios such as accessing drawdown earlier,’ it said. Tom McPhail, head of policy at Hargreaves Lansdown, said: ‘Investors need simple, timely pointers to their options for accessing their pensions. ‘The introduction of a simple document of no more than a couple of pages with clear concise information, will be a welcome relief to anyone who has ever had to wade through the gobbledygook which has sometimes been sent out by pension companies in the past. He went on: ‘Many investors are happy making their own choices over what to do with their pension pot. It is only fair they are given a statement of costs which allows them to compare one option against another. Andrew Tully, pensions technical director at Retirement Advantage, said: ‘People have fully embraced the ability to withdraw cash from the age of 55, often before planned retirement, and often ignoring the tax implications for doing so. ‘A high proportion of consumers fully withdrawing their pension pots are simply moving their money into another savings product, a decision which is likely to mean they pay more tax than they need to. ‘I’m not a fan of default retirement pathways, but it is startling to note FCA’s findings that over one-third of non-advised drawdown customers are wholly holding cash. ‘While cash may be appropriate as part of a portfolio, or as a short-term strategy, people using drawdown need to generate investment returns to mitigate the effects of inflation and charges. Steve Webb, former Pensions Minister and now director of policy at Royal London, said: ‘The biggest risk is not consumers running down their pension pot too quickly – for which the FCA says “it has not seen much evidence” – but savers locking their money into low-return cash investments for decades. Steven Cameron, pensions director at Aegon, said: ‘The financial regulator is concerned that some people risk poor outcomes, particularly if they do not first seeking professional advice. ‘Those who go it alone run the risk of picking the wrong type of retirement product, paying uncompetitive charges or investing inappropriately, for example holding cash longer term when they should be looking for investment grow. Tom Selby, senior analyst at AJ Bell, comments: ‘The pension freedoms announcement in March 2014 was a shock to everyone in the industry – the FCA included. ‘More than three years after the reforms were introduced, today’s report represents the regulator’s first serious assessment of how the market is working. ‘Given the level of pressure exerted on the FCA from various quarters, it felt inevitable some form of intervention would be proposed with the aim of protecting non-advised drawdown savers. 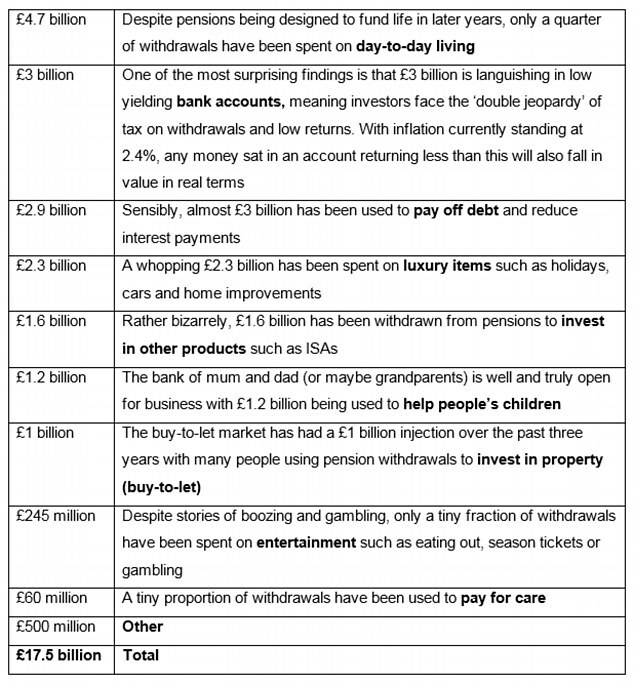 AJ Bell surveyed people who have accessed their pension since the freedoms were launched in April, to try to work out what has happened to the £17.5billion in total that has been withdrawn so far. Its findings are below. Lee Hollingworth, partner at Hymans Robertson, said: ‘The vast majority of people are underserved and unsupported with the decisions they now have to make at retirement. ‘It’s great to see the measures proposed to encourage shopping around for drawdown, particularly showing a first year charge in pounds and pence, to allow consumers to more easily compare charges across a number of providers. This is a useful basis to enable customers to shop around. But we need to do more. ‘It’s disappointing that the FCA hasn’t proposed a charge cap for drawdown. We have one of 0.75 per cent in workplace DC accumulation [savings for retirement] and we see no reason why this shouldn’t the case for decumulation [making withdrawals in retirement]. Patrick Connolly, chartered financial planner at Chase de Vere, said: ‘Many people will be making the wrong choices if they’re not taking independent financial advice, although to date the extent of any problems may be camouflaged by the strong stock markets we’ve enjoyed over the past nine years. This won’t last forever. ‘The best approach for people looking at accessing their pension benefits is to take independent financial advice, because the decisions they make are usually too important to get wrong. Andrew Pennie, head of pathways at Intelligent Pensions, said: ‘It is disappointing that three years into pension freedoms there is growing evidence of pension scams, expensive mistakes and a general lack of engagement and understanding of the new pension freedoms. ‘We know that people will generally switch off when faced with complexity. The additional choice and options now available to people when accessing their pension has made what was already a very complex market, even more so.